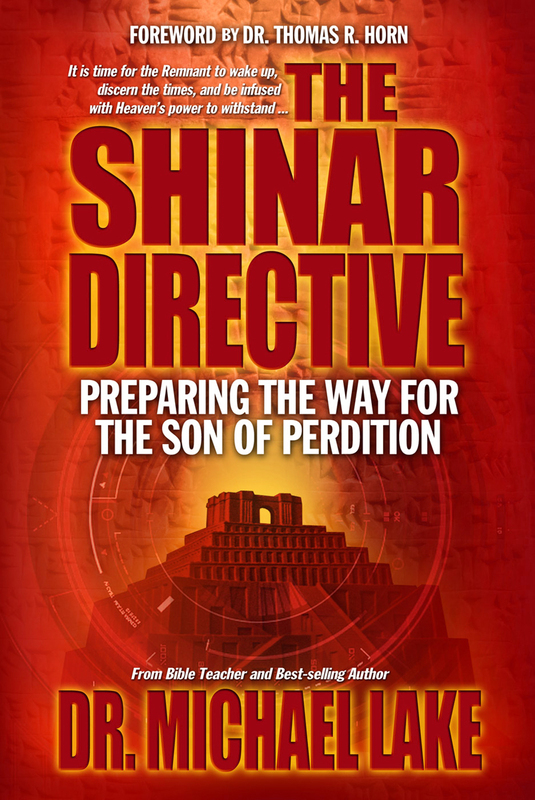 In researching this portion of my upcoming book The Shinar Directive, I really struggled with what aspects of the Tower of Babel story to examine. I could easily dive into the rich minutia contained within this story and miss the main points that we need to explore. So, before I examine this unfinished conspiracy, let’s look at some basic information regarding the Tower of Babel. The gathering: Nimrod gathered the people together in direct defiance to God’s instruction for Noah to replenish the earth. Men working together also served as a mechanism to build a society in which men need not walk with the Creator to survive and thrive. They developed reliance upon one another (secular system) and developed gods most likely based upon the legend of the Watchers and the Nephilim. The construction: This tower/altar was made of bricks (more on this shortly) and sealed with bitumen. Bitumen is asphalt in its natural state. This substance would have made the tower waterproof. [i] Again, this reinforces the concept that they were preparing themselves to withstand another judgment flood. Make a name and prevent scattering: I will address the concept of making a name for the citizens of Babylon a little later in this chapter. Their refusal to scatter shows their absolute determination to defy the instruction of God. So the tower served as an occult symbol of the rejection of the Creator and the establishment of a god system that catered to the sinful/carnal desires of fallen man. The power of being one: The people had a singular focus of building a civilization that would draw men from the Creator. God said that the people had one language, and they were completely unified in their Babylonian work. Because of their unity, God said that they could accomplish anything they envisioned. The Tower of Babel stands in the sands of time as both a prophetic and occult lightning rod. God chose to include the story of this tower within Holy Writ, because it will add to our understanding of the final days before Jesus returns. When God confused the tower builders’ language and stopped the progress of the tower’s construction, it also served as an incomplete aspiration for all divisions within the occult world that demanded the completion of the original work. Most biblical commentators believe that the Tower of Babel was in the shape of a ziggurat. The abrupt intervention by Almighty God would also suggest that the structure was never completed. 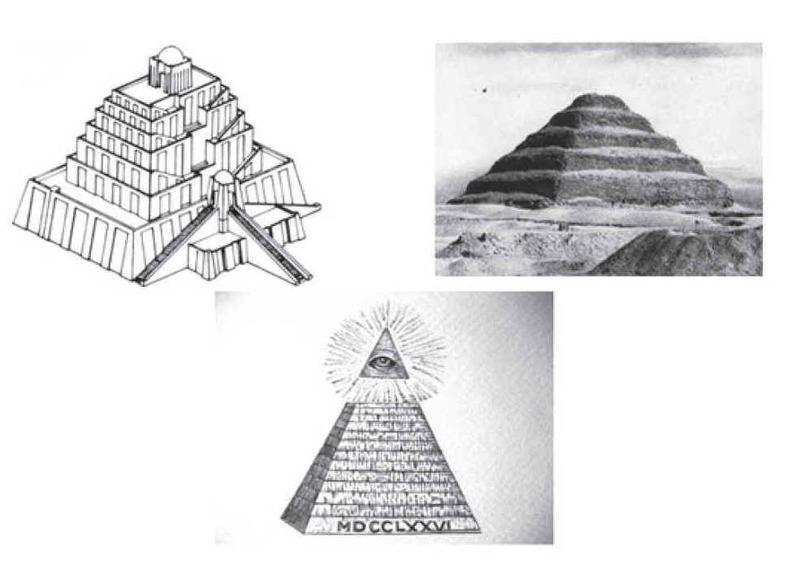 When you look at the shape of a ziggurat and that of the unfinished pyramid on the back of the US dollar bill, you will notice that they are very similar (especially since Nimrod did not complete the tower). This shape is also known as a trapezoid. The trapezoid is a specific geometric shape used within the occult to attract both demonic energy and demons themselves. You will find this shape in old-style homes that were similar in design to the one used in the 1960s TV show, The Munsters, as it was associated with haunted houses. Another name for the trapezoid is the frustum. I believe this second term associated with this shape illustrates the frustration of all those associated with Babylon, because their great work remains unfinished. It is also interesting to note that the Masonic altar is trapezoidal in shape. Like all things within a Masonic temple, this could be a hidden identification to the work they are all laboring to accomplish. The Tower of Babel chosen as a symbol for unifying Europe:—Isn’t it interesting that the leaders of the European Union chose the only symbol within human history that caused intervention by God Himself? Not only is the symbol used, but the leaders declare that they have overcome the judgment of God (confusion of the languages) by providing one voice for the people of many tongues! So the EU poster is announcing a working of dark magic for evil. The numbers eleven, twenty-two, and thirty-three are important in Masonic endeavors. The number eleven announces the beginning of the work, the number twenty-two then adds action to the undertaking, and the number thirty-three declares its completion. This poster was announcing the beginning of a work of dark magic to complete the unfinished Tower of Nimrod. The People in the Poster: Notice the people in the poster. 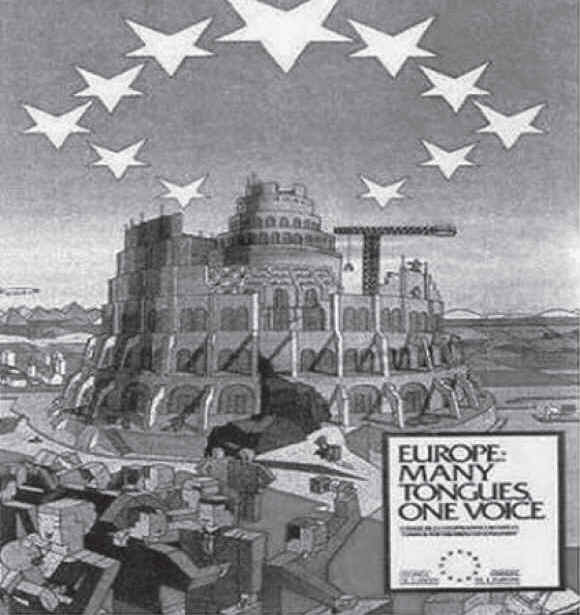 (If you cannot see them well, you can simply do an Internet search for “EU Tower of Babel Poster” to get a better look.) The people are brick shaped. This is the declaration that the end-time Tower of Babel will not be made from physical bricks, but from people who have been conformed to the Babylonian mindset. I have referred to this onion analogy many times with my students over the years. Its outer layer is pure white, but as you peel off each of the layers, they gradually become darker. The center is completely black and is pure evil; only a few individuals know the complete plan. As horrific as circumstances were under the leadership of Nimrod in Babylon, I cannot imagine how new features were added that were even more blasphemous. But I believe that, historically, Reverend Hislop is correct. The system the military and governments use to keep secrets is based on the esoteric layering of the mystery religions. When I served in the military, one of my posts required a secret security clearance. After the vetting process was finalized, I had to sign documentation that I would keep all information secret, would only reveal the information to those of secret clearance or higher, and only to those who had a need to know. I had to learn about the various clearances, the compartmentalization of those secrets, and the levels “above top secret.” One of the more interesting concepts was compartmentalization. A select few men and women with “above top secret” clearance reviewed information within a briefing room. The information could be discussed freely within the room, as long as everyone had clearance and a need to know. Once the men and women left that room, the information could not be discussed for any reason—not even with each other. When they left the room, the project and information ceased to exist. This is the way the Game of Thrones is played and how secrets are kept. For many in government and the military (as well as the occult), few have the big picture. They are only provided the piece of the puzzle they are required to implement. [i] Elwell and Beitzel, Baker Encyclopedia of the Bible, 362–363. [ii] Edward F. Murphy, Handbook for Spiritual Warfare (Nashville: Thomas Nelson, 1996) 231. [iii] Frank Gaynor, ed., Dictionary of Mysticism (New York: Philosophical Library, 1953) 136. [iv] Dune was written in 1965. Herbert not only describes how the Elite think, but he foretells the fight for oil (Spice is used as a metaphor) and the rise of an Islamic messiah who will oppose and gain the upper hand over the Elite by being transmuted into something else. [vi] Ceslas Spicq and James D. Ernest, Theological Lexicon of the New Testament (Peabody, MA: Hendrickson Publishers, 1994) 462. [vii] Timothy Friberg, Barbara Friberg, and Neva F. Miller, Analytical Lexicon of the Greek New Testament, Baker’s Greek New Testament Library (Grand Rapids, MI: Baker Books, 2000) 256. [viii] Albert Pike, Morals and Dogma of the Ancient and Accepted Scottish Rite of Fremasonry, new and revised ed. (Richmond, VA: L. H. Jenkins, Inc., 1950) 104–5. [ix] Hislop, The Two Babylons, 43.